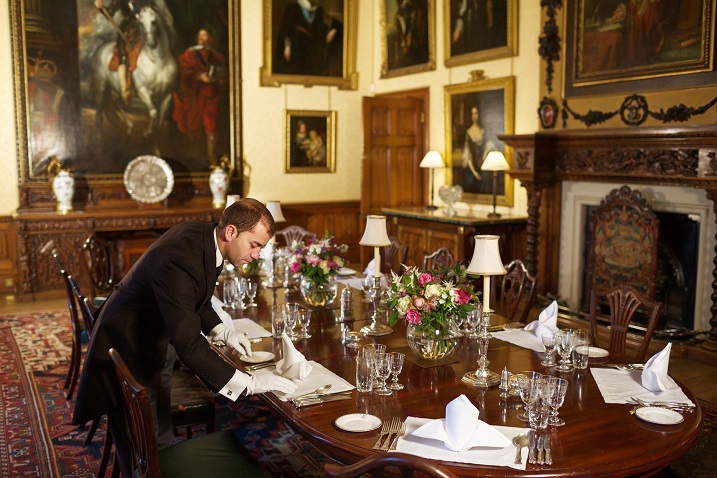 At various points during each series of Downton Abbey, Carson the Butler and whichever footman was employed at that moment (Thomas, William or James) would be shown, with all due care, setting the table for a formal dinner. 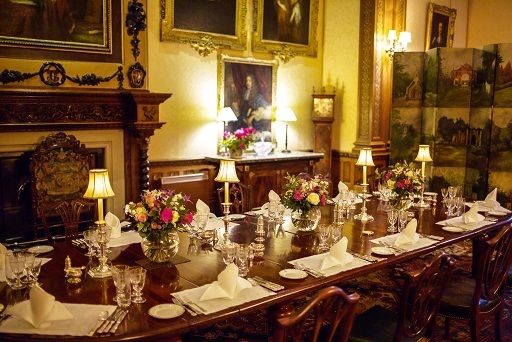 There would only be a few glimpses of the process which, in reality, takes Highclere’s own team of Luis, Jorge and Matthew well over an hour to achieve for a dinner party of 14 guests. Wearing white gloves and using a keen eye, everything is carefully positioned and assessed for being sufficiently polished. This applies not just to the cutlery but to all the various silver decorative pieces that are used to set a formal table. Of course, gold and silver have been valued for their value and rarity for eons which rode hand in hand with the need to preserve and prove that value. In the UK, the Goldsmiths Company is one of the twelve original livery companies of the City of London, receiving its first royal charter in 1327. Responsible for testing the quality of gold and silver goods, gold and silversmiths were required to bring their work to the Goldsmiths Hall for assaying and marking, hence the ‘Hallmark’. Beautifully elaborate and high quality items could be created for wealthy patrons and valuable skills passed from generation to generation, through a thriving apprenticeship system. 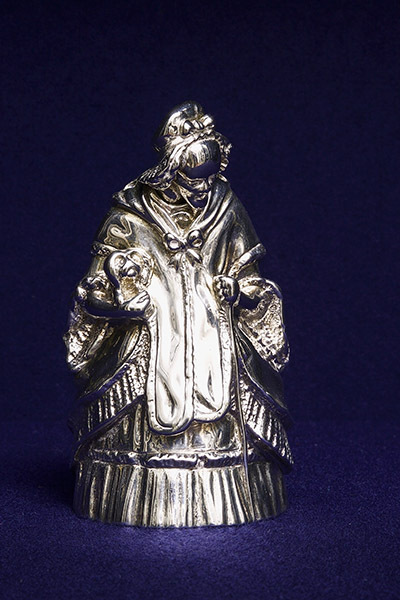 In the 18th century, well-to-do families commissioned canteens of family silver which was for use (rather than purely ornamental) and which also helped mark and establish their position in society. Ever practical, the wooden boxes could be locked and carried from their country seats to London for the “Season”. The table lighter has a gimbal-set burner and the whole is fitted to an antelope horn handle.The hinged arm of the lemon press opens to reveal a well into which the fruit could be placed and juice squeezed into a glass held on the stand. The industrial revolution with its rise in technology and production values enabled larger quantities of high quality merchandise to be available at more competitive prices to an emerging consumerist middle class. Silver was without doubt a status symbol. Thus Charles Dickens, in the novel “Our Mutual Friend”, described the Veneering family through their dining room and polished shiny silver: everything was shiny “bran new people, in a bran new house”, from their friends, to their footmen and of course the plate. As described in books by Evelyn Waugh or those of P G Wodehouse to real life examples, nothing has symbolised the decline of aristocratic characters more than the sale of the family silver. Every large house when pressed, has found less need for silver canteens which take hours to polish and furthermore, cost money to insure. In modern parlance, “selling the family silver” as a quick economic solution has entered the lexicon as short hand for describing unwise asset stripping. 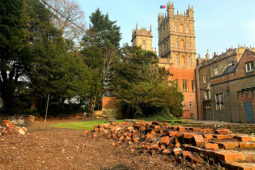 Highclere has also faced challenges and some 25 years ago my father-in-law took the difficult decision to sell some outstanding silver pieces to help finance much needed and major repairs (including stonework) to the Castle. In this case it helped reinforce capital assets and thus support future revenue. Other pieces were nevertheless retained and we have now created a display room for them, not far from the Egyptian Exhibition. The Egyptians of course attributed a high value to silver as it was so rare. The silver room is a good way of sharing the history of collecting, as well some information about individual pieces and thanks to the silver, Highclere is still here – in this case it helped reinforce capital assets and thus support future revenue. Another interesting piece. When I visited Highclere two years ago (how time flies) I got to see some of the beautiful pieces of silver that the Carnarvon’s own. It is a great shame that some had to be sold but as they have kept the castle afloat then I suppose needs must. Were any of the family silver used in Downton Abbey? Looking forward you’re next blog. They hired in china and plate from various location companies as there was no way we wanted to have and broken or lost. Simpler for us all! Fondly Remembering passing through those doors a couple of summers ago. The tour of your home was lovely and the memories of Downton Abbey came flooding back! Someday I’d love to return for one of the events you have and sit a while in the Secret Garden again! That was a very interesting piece. Thank you for all the information. 14 guests … a beautifully polished piece for each course … and the accessory pieces, this coupled with the linens, china, crystal, and flowers … it’s an extraordinary palate from which to create a captivating table setting for guests of Highclere. Who last used a Tichborne Celebrity? What was served? It’s a very special history. I think I should finally order the name plate for the box that holds our “good” tableware. I’ll have to come up with a name. We do use our formal dining room many nights per week and do like to set a beautiful table for guests, but I’ve just realized that although my table will seat 14, I wouldn’t have enough silverware for each place. I have to be careful about courses as it is, as there are only six pieces per place setting, not quite “Celebrity” status. 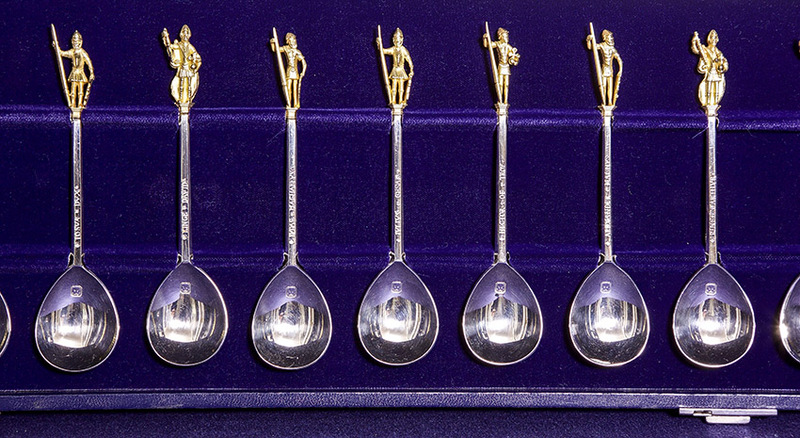 (That may well be the best name for a set of spoons ever.) Thank you for sharing. A beautiful table! Classic elegance we don’t see very often today. Thank you for sharing the pictures of the table and the historical treasures. I cannot make out the FAMILY MOTTO, what is it, and what is the motto telling those who enter the abbey? Also, it is so nice to see the inside of the rooms in your pictures, as well as I view them on the Downton Abbey movie, which I watch everyday. I was waiting for the question!!! It is a great take on how we live and who we serve – Thomas A Beckett was killed, Henry VIII took a clear approach – you served him – and of course Charles I whose portrait is in the dining Room was executed. Whilst in the USA you began with a secular state and no titles – just Mr President. A wonderful story. Thanks so much for sharing. I too loved my visit to Highclere! I looked forward to this morning’s blog. I think I’m addicted! When I was growing up as the second oldest of 10, my mother made sure we always set the noon meal table with or “good dishes and silver”. Boy how I hated all the fuss. Today I wish my mama was still here. Getting older has its benefits-the heart does grow fonder. Thanks for the beautiful picture of a lovely table. And a wonderful history lesson about life in a time before taxes. Sadly there have probably always been taxes but you are right but never so many as now. I always learn something new about Highclere Castle, as well as England, when I read your lovely blog. What an elegant table is set in the Castle, and no doubt such beauty enhances what are no doubt already delicious repasts there. I can only imagine how long it would take a few staff members to orchestrate such an elaborate table. It was timely for me to read your blog today, and to be reminded of all the marvelous Downton episodes. Serendipitously, we decided to rerun the entire series. It’s been long enough ago, that we were really missing it, and long enough ago that it seems so fresh, as if we’d never seen it before. I’d forgotten some of the interesting nuances. We even turned on the subtitles. Normally, I don’t like to use them, but we had so many guests watching with us last time, and with all their ooh-ing and ah-ing (particularly over the likes of Matthew Crawley! ), it was sometimes difficult to catch all the dialogue. (Americans and British don’t exactly speak the *same* language, after all!) 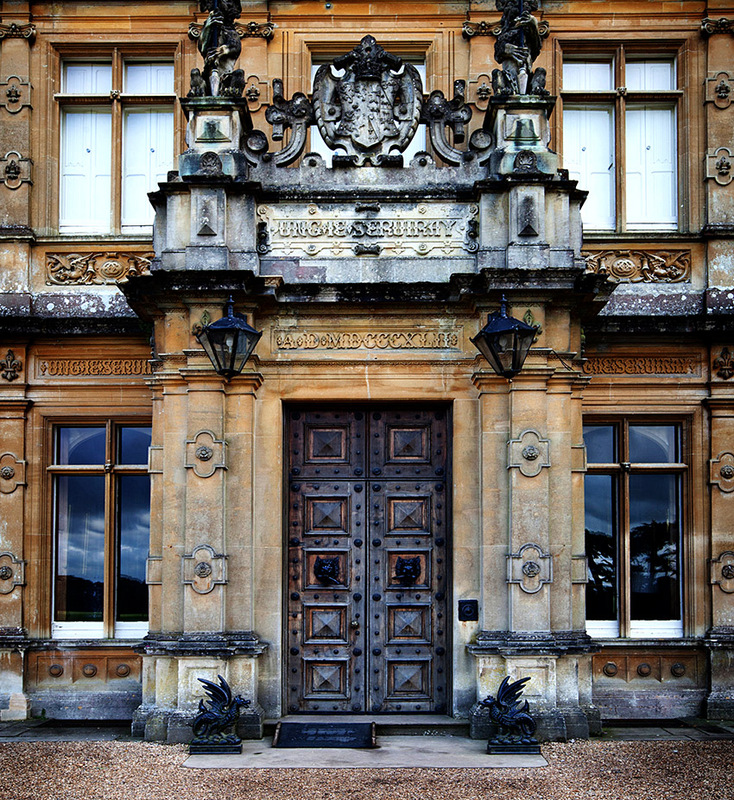 It has been a delight to visit Highclere again via Downton Abbey, and scenes such as the one you depict here. We also visited Highclere Castle in 2013 and have such fond memories of ambling around its great rooms and grand grounds. I’m so glad you and your husband made the decision to open it to the public. It must, at times, feel like an invasion of Americans to you! 🙂 Referring to the gentleman who posted above me, I hope you will tell us your family’s motto. I can’t make it out. Also, w/ regard to the little spoons, I have one very similar which I bought in an antique shop in England on our second visit there. I’m not sure which little man presides atop my spoon, however! It’s a cherished silver treasure of my own. I continue to recommend your blog and your books. They are beautifully rendered. Thank you! My Mom gave me two sets of silverware – since I only need one – we sold one for a mortgage payment – But I love entertaining with the one I have – makes its more special! It is interesting how times and tastes change. I spend a lot of time in the American west and own a fair amount of western sliver jewelry, but we have at least two full eight piece sets of classic silver flatwear, complete in their fancy box, along with assorted orphan pieces that came down through my husband’s family, (along with a twelve piece set of Royal Dalton china), that live in the dining room side board (a room we also don’t use) and have not seen the light of day in years. I actually offered the Royal Dalton to one of my step daughters, and she turned it down. I hate leaving the silver to gather dust in a drawer, but I also don’t want to sell it since it is beautiful enough that I would not want to see it melted down for silver content, which is probably what would happen to it here in the US. If I were a good enough cook and more ambitious, I could have done a pretty credible “Come and Dine” effort, but classic dinners and cooking are not in my realm of doing without a Carson and a Mrs. Patmore. You will have to persuade some friends next year to aid you with Come and dine next time – they can be part of your story as Mrs Patmore and Mr Carson!!! Is there a ‘typical’ menu that you serve at your formal dinners? The picture of the walnut doors is fascinating. To think of all the royalty, noblemen, government officials and everyday folks that have passed through these doors over the last thousand years. What an amazing story that would tell. There is no typical menu – it depends on the season, but I am always looking for balance and diversity. I think about who is coming and want to treat them. Can’t tell you how much I enjoy reading your articles regarding times past at Highclere Castle. I have always enjoyed the civility and formality of dining, socializing etc as shown in the Downton Abbey production. The attention to detail that was the norm back then is such a luxury today in our fast paced society. We are supposed to have more time of course!!! A fascinating story about silver. I have silver pieces that belonged to my great-grandmother, grandmother and mother. It is an eclectic collection, but has so much sentimental value. Our family didn’t sell the silver, but we have some gold rings with the diamonds missing. We don’t know who had to sell the diamonds – no one confessed – it has always been a mystery! How I love seeing a well set table with beautiful shiny silver. My mother worked for a year to purchase a beautiful set of flat wear. I have it today in it’s original casket, I don’t know why it was called a casket, perhaps you can help me with the history of the use of this word for silver storage. Her silver is hollow but still quite heavy. Is the English silver hollow as well? My kingdom for that lemon squeezer, but only if an orange fits it as well. I now have a new mission at the Craftsmen’s Fair’s we have this time of year. The Fair in Sewanee is coming up, and I am taking a photo of your citrus squeezer to take with me to see if I can find an obliging crafter who will fashion one for me. I only hope they can provide the horn! Happy Spring to all at Highclere. I can imagine the chartreuse lush grounds popped with color by narcissus, daffodils, hyacinths, and buttercups. A bit early for our tulips here, because of the harsh winter we have had, but Cheekwood is sporting 150,000 pink tulips now so surely mine will bloom for Holy Week. On that note, I’ll take this opportunity to wish all at Highclere a glorious resurrection remembrance Sunday, along with a beautiful and reflective Holy Week. Please give our warmest greetings to Mr. and Mrs. George Carey. George is very dear to my heart as the first Archbishop to ordain a woman into Anglican ministry. I must ask, what are you planning to wear to the wedding Lady Carnarvon? I do so hope we’ll see a picture. Lovely to see the silver, china in “real time”…..It is a shame that in these times we (I) we do not have the time to polish the silver…..sometimes I display some beautiful decorative silver pieces and tell people that I love the patina (excuse for un polished) of old silver !!!!! Thank you Lady Carnarvon for spending the time to share an insight in Downton Abbey …….. Reinforce capital assets, support future revenue. I just love your blog. You write so beautifully and I can picture each thing you describe. I particularly enjoyed this one, as I love silver flatware. I enjoy using my China, silver and crystal so much, even though I don’t entertain formally. My items are not old, having only received them for my wedding in 1985. 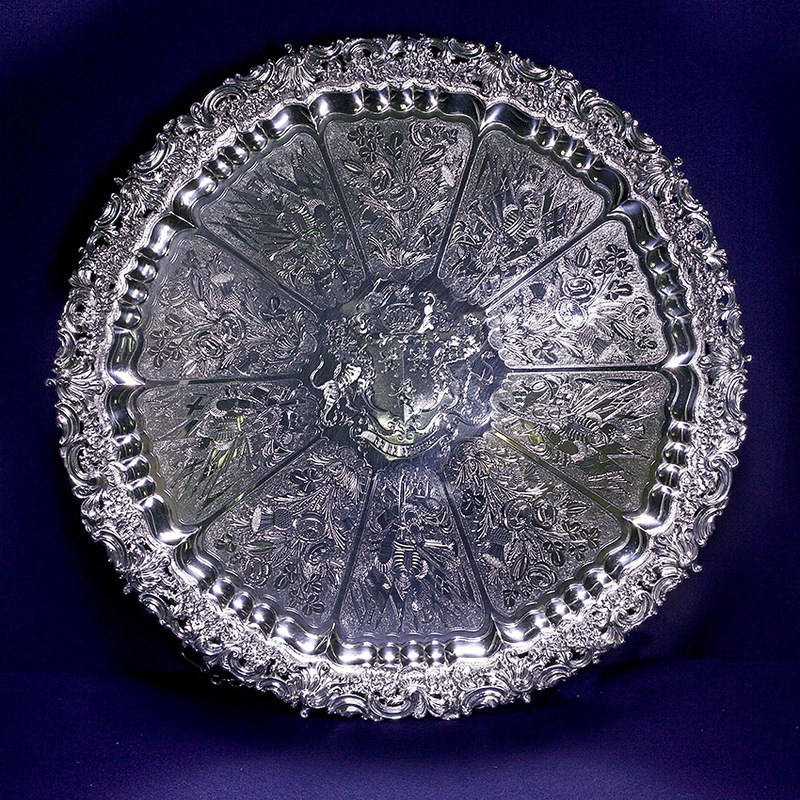 The piece I most treasure is a circa 1800’s sterling entree dish we received from a wedding guest. Some day I hope to see your beautiful home and your silver. Best wishes from Texas. Your entree dish sounds lovely – it is all about collecting isn’t it? This was a lovely article. Especially loved the little lamps going down the center of the table, but couldn’t figure out how they are powered. Batteries perhaps? What a lovely blog about the silverware and dining setting at Highclere, and “selling the family’s silver”, well, enough to repair a leaking roof perhaps. But also about the collections of treasured items that are passed down from generation to generation. In today’s modern setting, with the hustle and bustle, fast food mentality, it is so nice to just stop…and create a formal dining setting with friends and fine food. Participating in the Come and Dine event made me open the upper cabinets were a few vintage items from my mother-in-law had been stored away for at least 30 years. A lovely silver set with glass containers for serving olive oil, vinegar, salt, pepper and oregano that I had packed away in a box, was brought out, shined up, and used for that special formal dinner. Now it is on the kitchen counter and part of the table setting for many a Sunday dinner with invited friends and family. Thank you for the inspiration to appreciate the historic past times when dining was an art! Thank you – and your dinner party was so elegant and a tribute to food and conversation! Just curious, what would be your favorite formal meal to serve and also your favorite informal family meal? Actually I think I have begun to share them in “At Home” – Scallops are a delicious first course but it does depend on time of year, I think we need more earthy greens or red cabbage here in the winter and again it is balancing a more formal dinner so it is not too heavy and everyone sleeps well. I also mix up the fish or meat and would never serve meat twice in one day. My visit to Highclere in the fall of 2014 was the highlight of my trip. I love a beautiful table and used to do a bit of entertaining at holidays. One of my most treasured possessions is a set of silver flatware my mother bought when she and my father married back in 1955. I use it every day. The pattern is called First Love. Wishing you and yours a blessed Easter and a beautiful spring. It is the idea of inheritance and passing on..
My Mother loved hosting small, intimate dinner parties when I was a child. Dressing up, laying the table correctly, she loved details. She passed that on to me, so my Dining Room is perhaps my favorite room in my home. I keep the table always set, with China, linen, flatware and crystal, as an homage to my upbringing. My now grown children love nothing more than dining in this special room! And my Mother, who is 91, and has an eagle eye, misses nothing! I get the nod of approval from her! Thank you so much for sharing these glimpses into Highclere! I can’t wait till I visit and see the silver exhibit. We have a silver coffee and tea service that is only 100 years old but it’s a family treasure. Thank you for blogging and showing us all the history your house has to offer. Is the walnut door original to the castle? I live in a walnut orchard in California and have never seen a door quite like yours. I didn’t even know it was walnut. I had much pleasure in visiting your home last September with my family (from Australia) and also enjoyed the Downton Abbey series. So sorry it has finished. I took a photo of your front door & as a keen novice artist have painted it. Such lovely memories. Thank you for sharing your life with us all. How lovely – it is a good entrance story.. In reference to my earlier post: I unearthed my “little man” spoon. I only have one and it reads on the handle: “Guy of Warwike” (spelled as I have it here). We bought it in a very old English town (can’t recall which now). My husband said it comes from a set of twelve, but we only have one, and no doubt it’s a replica. 🙂 But I’ve enjoyed using it with tea. I suspect it was made as part of the set – the set just broken up and sold separately.. I loved hearing about the Carnarvon “family silver. Like all lovers of beauty, I love gold, silver and precious jewels so reading this blog post was a super treat!!! As always, your words enchant and instruct. I hope you utilize some of this finery for your Easter feast, and enjoy a blessed day with family and possibly friends. 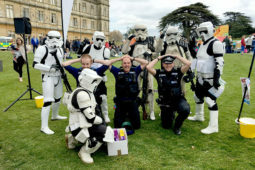 We are holding an Easter egg hunt for a children’s charity the NSPCC and after Church I will be looking out for wellies rather than silver with the weather as it is – still fun! You have such a wonderful gift of explaining, story-telling, History rendering. You not only keep it all alive, your explanations of worth and wealth are so clear and yet noone feels out of place reading your beautiful accounts. We are there- 1592 is present in each of us as we live your writings. I’ve seen the beautiful silver and gold settings used, and time has not diminished their beauty. You are definitely too kind!! Beautiful table , and the door to your lovely home is very welcoming. I love the idea of touching History and that is what the door evokes in me. Speaking of silver, I don’t do much in the way of dinner parties but when I moved and couldn’t find my usual flatware I found my Mother’s silver that had been boxed up for fifty plus years; I use it every day now! Why not use the things of beauty instead of hiding them away? Well done on sharing your gorgeous table with us ! HAPPY SPRING!! I SO ENJOY YOUR BLOGS. Thank you – Happy Easter! I so enjoy your writings and value your generosity in sharing your time and experiences with us. Time in this era is speeding by and everyone seems to be so very time poor; especially for the finer details of daily life, the social graces in line with Debrett’s directions! The link you provide to bygone times makes us aware of our Heritage, teaches respect for all the treasures that have come to our lives through our English forebears’ history and culture. For you to share this with us and to give your time to is a rarity in today’s world. As we enjoy the glories of the “Cartier Exhibition” now displayed here in Canberra, I wonder about the jewellery of the Carnavon family. It would be wonderful to learn about life at Highclere from that perspective one day too. Thank you and please know how very much your work is appreciated. I have only just found your blog, although I have read some of your books and much about the history of your home. 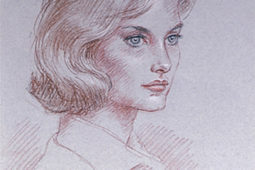 I am a nurse so the stories of Lady Almina turning Highclere Castle into a hospital during the war fascinated me. I love history and I appreciate your willingness to share the history of your home and family. The silver post has been very interesting and I have enjoyed it immensely. It reminded me of many of the beautiful antiques my mother collected when we lived in East Anglia when I was younger. I know the years I spent in England influenced my love of history, and tea, of course. I have searched through your blog, reading old posts, looking for stories about the library without success. Have you written on it? If not, I would dearly love to hear of the books contained on the shelves of your library, just in case you need an idea for a future blog post. Two of my favorite things: books and history. Thank you – I think the first reply should be Hallelulah! I will indeed think about a Library post! And I hope that we can meet each other then. It would mention a lot to take a picture with you. I will be around an hope to see you! Blessings to you and your family during this Easter time. My first visit (not my only visit!) was yesterday. As I came alone- and unsupervised! – I could take my time to fully appreciate and enjoy the rich history that you all have made possible to us by opening your home and gardens. My mother and grandmother were schooled in many, proper Victorian ways and mannerisms that were instilled in us whilst growing up. Seeing this history throughout your home (and on Downton Abbey) was so very personal and special to me. It made my heritage come alive. I wish your walls and rooms could talk. What a legacy and story they would tell. Wouldn’t that be an interesting mini series! I won’t forget my visit and will plan another one soon when the gardens are bursting with joy and flowers. With Sincere wishes for a Happy Spring! I’ know I’m late in reading this blog… I was thinking of selling my family silver flatware ustensils and now you make me debate with the idea. I don’t need the money, just don’t use it as much now as I have a smaller living space to host. Also, I saw The Tichborne Celebrities when I visited last summer and they really captured my attention, such a special collection. Interesting to see the handmade work as they are a bit irregular, but giving them such a very special value. Thanks for sharing! Some years ago my grandmother gave me a pair of Matthew Boulton silver candlesticks. They had an insert with two arms for two candles. Beautiful, but! The maids over the years polished them down to the bare copper and polished the hallmarks away (sigh). Granny (Gertrude Holden, 1st wife of T.A. McGinley; your mother-in-law would know of her) didn’t want to give me damaged goods and mistakenly had them resilvered!!? They are pictured in a book I have on Boulton. I am told there is a way of bringing up the hallmarks from the copper. Is that true? Even with the new silvering? I am not a silver expert !!! I am not sure re comments – I do try and reply but that is a good question for the web design team! I can see Family Silver, Maple Tree, March Lambing, Furry Friends.. I enjoy all your articles, and especially anything to do with entertaining and table setting! I have a question for you. There is a slight difference in the European versus the American placement of cutlery for each individual place setting. In many photographs of English/European settings, I have seen a large spoon placed immediately to the right of the dinner plate. I assume this is a soup spoon. In American style, we always have the soup spoon to the right of the knives, as soup will be eaten before the entree and salad (work from outside in). Could you describe the use of these pieces of cutlery during a dinner? Cutlery is used from outside in, so any large spoon placed to the right of the plate would be the pudding (dessert) spoon. The soup spoon would be towards the far right of the setting (soup is quite often a second course after the starter and before the fish course). Ah! We place the dessert flatware above the dinner plate or bring it in later as dessert is being served. Thank you for clarifying!